Mirrors have always made for great horror film devices. How many dream sequences have we seen involving a nightmare addled protag washing his face in the middle of the night in front of his bathroom mirror only to look up and see a disfigured version of himself? Now Alexandre Aja turns this device into a full fledged evil entity in “Mirrors.” But other than some randomly creepy imagery it’s a paint by numbers thriller which gets more boring and uninteresting as it gets repetitive. Kiefer plays Ben Carson, a depressed former cop, fired from his job, separated from his wife and kids. Looking to get back on the right path, he gets a gig as a night security guard of a derelict department store, which has been vacant since a fire many years ago. Oops, the store is also haunted with some kind of spirit from within the mirrors. Instead of quitting and looking for a job that doesn't involve being scared to death by ghosts he starts investigating the history of the building and discovers it was a mental hospital before it was a department store. But when the mirrors start terrorizing his family outside of work Ben has to solve the mystery and cure the world of this spirit for the betterment of his family. It's easy to see where the idea of this movie came from, and it provides a fun and marketable genre hook. Haunted mirrors has never been done for, that's for sure. But what should be a simple haunted house "Shining" knock off, goes awry after the first act. It starts to suffer when 'rules' and 'logic' of the ghosts become hard follow (yes, no matter how fantastical a story, there has to be hard rules). 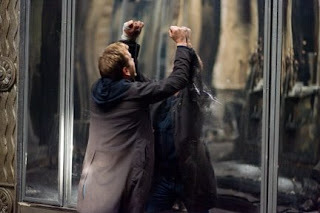 The mirrors are omniscient and can do anything to Kiefer at will, whether its setting him on fire, cutting his skin or just scaring him at random wherever he is. To the detriment of the suspense Aja quickly opens up the story to outside the store - any mirror in the world is an enemy of Kiefer’s. So any creepy claustrophobia, isolating character drama the film establishes is discarded for a lame Scooby Doo, Hardy Boys potboiler mystery. And as with this type of story we get a number of lengthy and laboured verbose dialogue scenes explaining the history of the ghost, it’s motivations and intentions. It gets worse when in the third act it turns into an action film. This is the same problem with Mikael Hafstrom’s “1408”, heavy on the physical action and discarding the deep psychology of horror. Aja’s look is also overly designed. The burned out department store is so dark and grimy it could be any old space. The ubiquitous flickering fluorescent light bulbs make it indistinct from the décor of the Saw movies. I couldn’t help but think how the film would have played in full light in a recognizable store – something more like “The Shining" or Brad Anderson's "Session 9". And what he could have done with those eerie old mannequins goes unrealized (maybe that's another horror film - "Mannequins"?!). I have to give points to Aja for his denouement though. I won't spoil anything here, but it’s really really cool, unfortunately it doesn’t broaden our understanding of the story or Kiefer’s character, like the whole movie, it’s just a really good tease.